Here's a superb new slots online casino from NetEnt. If you’re looking for a fast-paced, all action card game that will transport you to heady Vegas nights and the tables of Monte Carlo check this out. NetEnt have created a classic online slots games with Deuces Wild Double Up. NetEnt have rapidly become one of the most popular makers of high spec online slots. Formerly known as Net Entertainment, NetEnt are renowned for making online games that are as engaging and entertaining as they are rewarding. There’s something about card games that brings out the nostalgia for the early days of Vegas, the glamorous tables of Monte Carlo, or high-end European casinos. Great for a touch of escapism and those James Bond moments. Deuces Wild Double Up is essentially a version of Poker where the dealer operates from a 52 deck of cards but the number 2s are deuces and can be used as a winning card and swapped for any other. If you’re familiar with Poker you’ll find Deuces Wild Double Up a really simple game to play and this nice little twist will add a bit of interest to the proceedings. 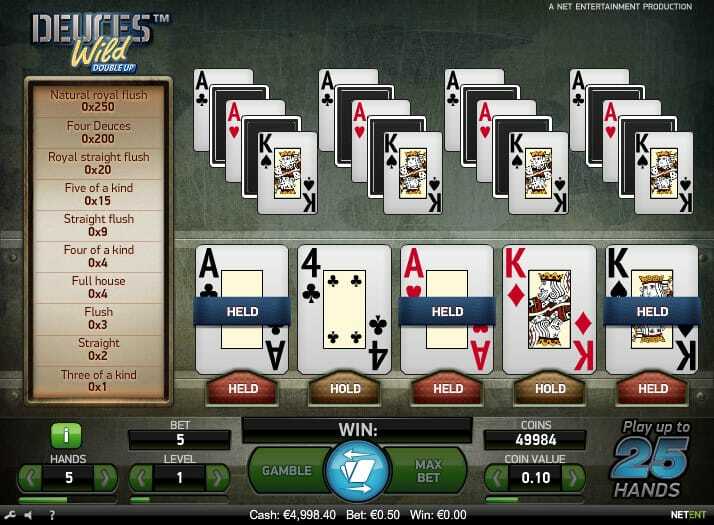 This video Poker game is nicely designed with neat graphics and easy gameplay. You’ll have a choice of 1, 5, 10 or 25 hands and you’re in complete control of the stake thanks to adaptable bet and coin values. As it’s based on traditional poker the aim of the game is to form poker hands out of 5 cards given to you by the dealer. So far so standard, it’s when the deuces come into play you see this is a poker game with a difference. 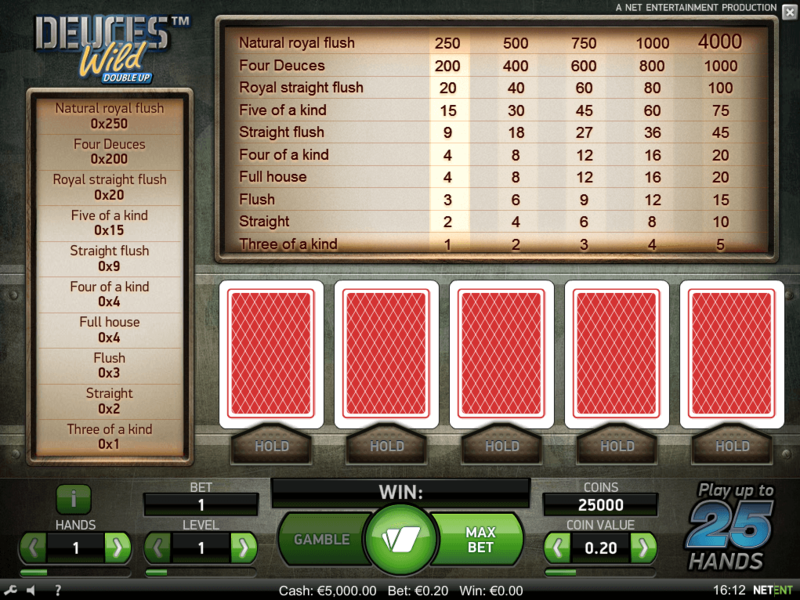 You can use a deuce, a 2 card, to substitute for any other card and help you create a winning hand. The ‘double up’ element of the game is essentially a gamble feature where you can gamble double your money for a shot at the double the rounds prize. Whether you’re looking for a break from online slots, or you’re a card lover through and through Deuces Wild Double Up is a fun way to play the tables without leaving the house. 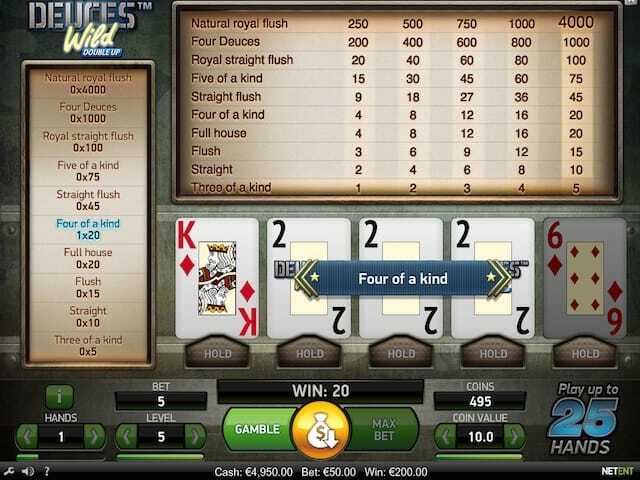 Poker lovers will enjoy the little twist their favourite game has been given and card novices will quickly get to grips with this game which with the introduction of the deuce wild isn’t really all that different to online slots. The added interest of the opportunity to double your bet this is a game that you’ll find engaging, and if the cards fall kindly, rewarding!